Doublefine's latest adventure, The Cave, is a quirky little puzzle game which allows three couch co-op players to experience the misadventures of seven colorful characters. I didn't know much about The Cave, having missed our earlier opportunities to see the game late last year, so I didn't know quite what to expect. I downloaded the title from the Xbox LIVE Marketplace, cozied up to my co-op partner, and dove in. The Cave began with the "sultry and mysterious" voice of, well, a talking cave. He (I'm assuming it's a "he" from the tone of his voice) introduced us to seven characters. Mr. "The Cave" gave a short, foreshadowy-ish description of The Knight, The Scientist, The Hillbilly, and all the rest while we figured out how to start up a co-op match. (Push "Start" or "Back" on the second and third controllers. Go figure). The game supports drop-in/drop-out co-op, which is fortunate, since there are times when the second and third players may be standing around doing nothing --but I'll get to that later. The gameplay is simple enough: The Cave is an environmental puzzler with very light platforming elements complemented by an entertaining narrator. The tone is rather dark, but it's presented in such a way that you can't help but smile as each character incompetently, ambitiously, or viciously vies for their own personal gain. The puzzles range from ridiculously easy (put a fuse in the empty fuse box) to almost Google-worthy (time travel has consequences?). The art style is pleasantly cartoonish. Characters have that unique Doublefine look, and the environments are bright, colorful, and tailored to each personality. We saw everything from fossils to satellites encased in the stony cross section views of the 2D levels. For our initial journey through The Cave we chose The Knight, The Adventurer, and The Monk. Each character has their own special power. The Knight can make himself invincible (but immobile). The Adventurer can use a grappling hook to swing from specific grapple points located throughout the levels, and The Monk can use telekinesis to manipulate certain objects. Other than their stories and special powers, there are no differences (such as speed or jumping ability) in the avatars. Each trip through The Cave is different depending upon which set of characters you choose. This is because their special abilities are required to access specific chambers in the game. For example, one of the early obstacles you'll come across is a long drop through a chasm full of fire. If you don't have the Knight's invincibility you won't be able to enter the area. Signs marked "Cave Tour" will guide you around that level and onto the next. Each game will take you through three levels tailored to your specific characters, as well as three transitional stages. Once a player has entered their character's specific level, co-op can get kind of wonky. Some areas require all three players to participate, while others are more focused on individual tasks. 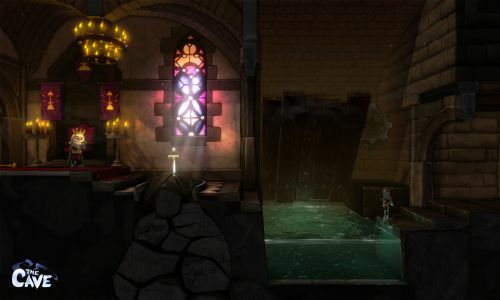 The Twins' stage, for example, is set within a large, Victorian mansion where whoever controls the devilish duo will have to solve several puzzles from inside the house while the other players kick rocks on the outside. I know that's kind of the point of The Twins story, but it can be a bit of a drag for the other two players. If you and your co-op partners are into discussing puzzles while one person plays the game, you'll be alright. It worked for us, but some people won't dig it.